All three of these recipes are super delicious and super easy. I made all three in one Sunday afternoon, and still managed to do a lot of cleaning and couch potatoing and Daisy snuggling/wrestling. I think I will break up the recipes into three posts, so as to not overwhelm and to keep each post a manageable length. 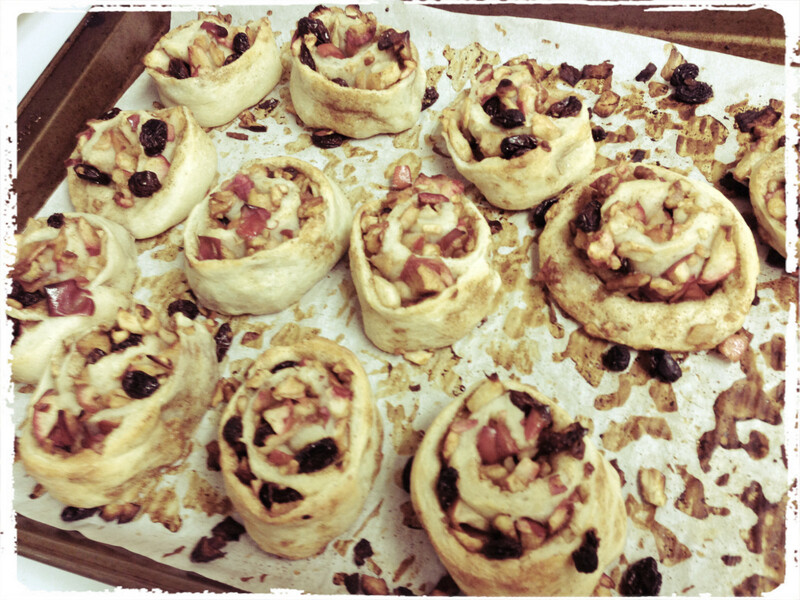 Let’s start with the Apple Strudel Rolls. These were delicious and easy and I love them. They were like little cinnamon rolls, only appley and less sugar! Much healthier, I am sure! 😉 And the raisins and pecans and apples and cinnamon and spices all came together so nicely to make this delicious little morsel of delight. Now, I did stray from my usual completely from scratch recipes for this one – it uses refrigerated pre-prepared pizza dough. 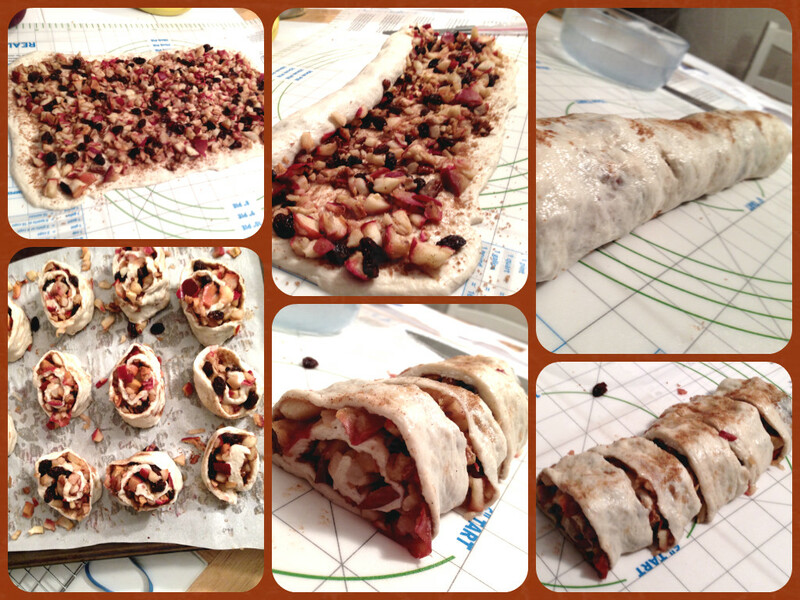 I was going to make my own dough, but just decided to stick strictly to the recipe, since it was so easy and I was tackling several recipes that day (and a headache from a little too much wine the night before)…If you want to make your own dough, go for it. It is super fun! 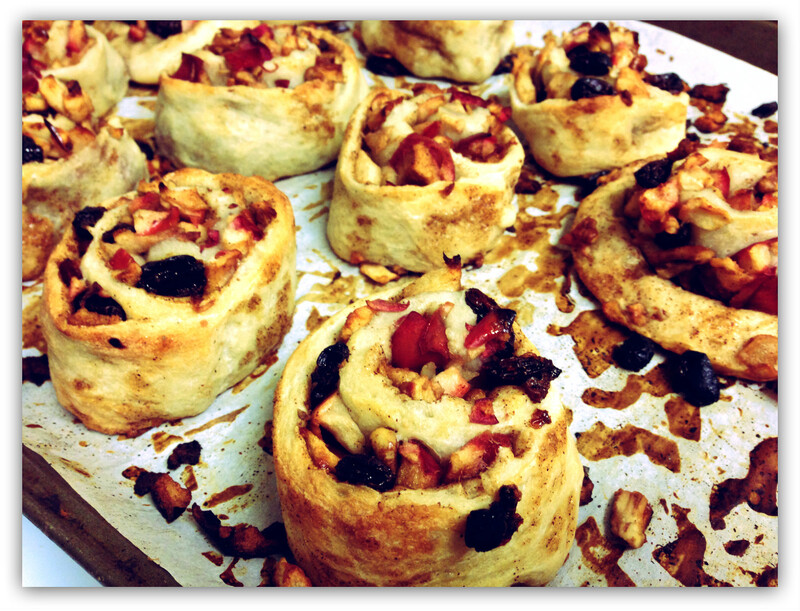 I have a recipe I used here in my Pesto Swirl Rolls that is great. I will give slightly more details in my directions than the original recipe gave. It left a lot of wiggle-room in the methods and, while that is okay, I prefer to be told exactly what should be done and then change things if I want; I do not prefer having to assume things in recipes from the get-go. Especially a new recipe! The other thing I love about this recipe is that it doesn’t require peeling the apples. For some reason, peeling, chopping, dicing, washing, and other food-prepping tasks really rub me the wrong way. I hate doing them. Lucky for this recipe, I only have to chop and dice the apples. And by “I”, I mean I got my wonderful boyfriend to chop and dice the apples for me! He’s such a good little sous-chef helper when he wants to be. Once the apples are chopped, the rest is a breeze. Add the pecans, raisins, and brown sugar, and pop them in your preheated oven for about 10 minutes. The original recipe didn’t give a time, but I left mine for 10 minutes and they were plenty soft. I probably could have done less too. But if you’re not using super-soft baking apples like I did, 10 minutes is probs perfect. Sidenote: I accidentally used pumpkin pie spice instead of apple pie spice. But they are close in the spices that they are made up of, and I was confident that it would still taste right even thought I was using the pumpkin pie spice. I guess I just had a brain fart at the grocery store and forgot I was working with apples, not pumpkins. Hehe. Well, at least I’m prepared for all the pumpkin treats in my future! These were so good that Christian forbade me from taking any to work! I didn’t complain; I ate my fair share too! Preheat the oven to 400 and line the baking sheet with parchment paper. Core and chop the apple (no need to peel apple). Combine the chopped apple, raisins, pecans, vanilla and 1 tsp of brown sugar in a bowl. Mix well. 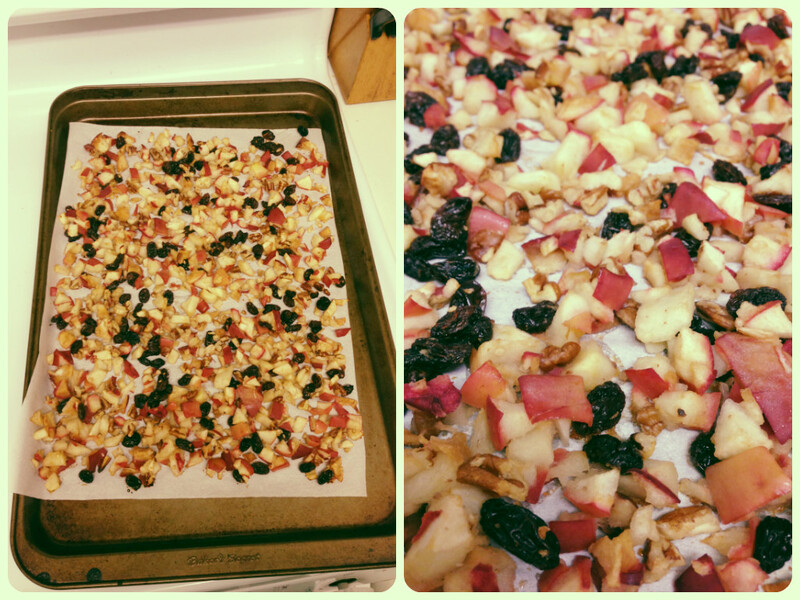 Spread the apple mixture on baking sheet and bake at 400F for 10mins, or until the apple starts to become soft. Set aside. Mix 2 tbs of brown sugar and apple pie spice. 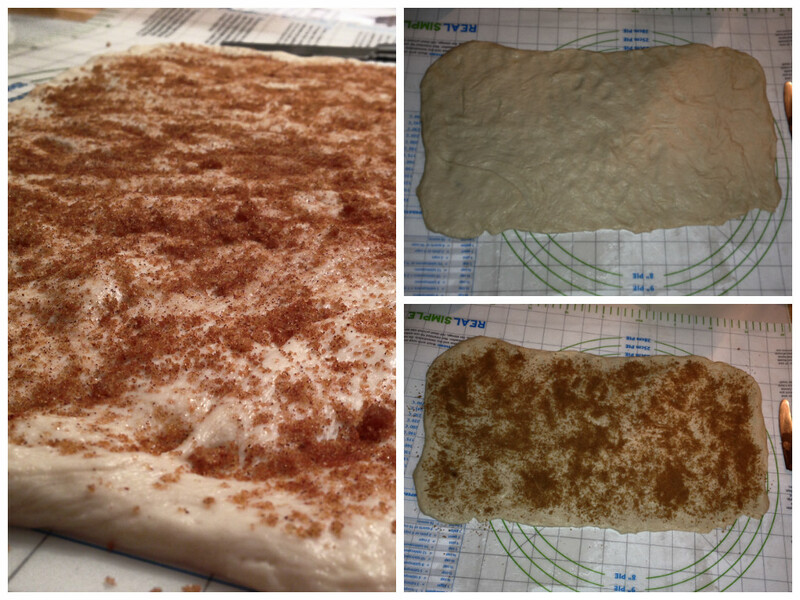 Roll out the dough and spread ¾ of the sugar/spice mixture. Bake on parchment paper-lined baking sheet for 12-14 minutes, until the rolls are golden brown.